Your system will record all the alarms that occurred during the last armed period. If an alarm was triggered in any area assigned to the keypad, the [MEM] Symbol will illuminate. The [MEM] Symbol will flash and the Numerical Symbols for each zone whose alarm was triggered will illuminate. 2) Press the [CLEAR] button to exit the Alarm Memory Display. The [MEM] Symbol and Numerical Symbols will extinguish. Note: The zones that were in alarm will remain in the Alarm Memory until the next time that area is armed. The keypad will emit a Confirmation Beep. The [ACCESS] Symbol will flash. If you have access to more than one area, press the Number Button representing the area you want to arm or  for all assigned areas. After the Confirmation Beep, the Exit Delay Timer will begin. If you have access to more than one area, press the Number Button representing the area you want to Stay Arm or  for all assigned areas. After the Confirmation Beep, the Exit Delay Timer will begin the countdown to arming. 2) Press the  button. If you have access to more than one area, press the Number Button representing the area you want to Instant Arm or  for all assigned areas. 2) Press the [FORCE] button. If you have access to more than one area, press the Number Button representing the area you want to Force Arm or  for all assigned areas. You can program area(s) to arm automatically (if enabled by your installer). The keypad will emit a Confirmation Beep. The [PRG] Symbol and Area Symbol(s) will flash. The [PRG] Symbol will flash and the [MEM] Symbol will illuminate. If you have access to more than one area, the Area Symbols that you have access to will illuminate in sequence. Press the Number Button representing the area you want to arm. 4) Enter the [TIME] you want the area to be armed according to the 24- hour clock (i.e. 9 a.m. is 09:00 and 9 p.m. is 21:00). The [MEM] Symbol will flash if a time is not already programmed. The [PRG] Symbol, the Area Symbol of the chosen area, and the first number of the previous time set will illuminate ( Symbol = zero). To view the time set, instead of entering the [TIME] in Step 4, the first number of the time you set will illuminate. Press the [UP] button to illuminate the numbers one at a time (the Numerical Symbol  represents zero). When the system is disarmed, the control panel deactivates the zones so the alarm will not be triggered if zones are breached. Any user can disarm the system unless their code has been assigned the Arm Only option. Based on your instructions the installer will program designated entry points, such as the front door or the garage door, with an entry delay. This delay will allow you enough time to enter your code to disarm the system before the alarm is triggered. You will only be able to disarm the area to which your User Access Code is assigned. User Access Codes with the Arm Only option will not be able to disarm the system. If you are disarming a Stay or Instant Armed area, use Step 2 and Step 3. For areas armed with the other arming features, use Step 1 and Step 2. The keypad will beep to acknowledge the entry, the Status Light will turn red, and the Entry Delay Timer will begin the countdown. If you have access to more than one area, press the Number Button representing the area you want to disarm or  for all assigned areas. The keypad will emit a Confirmation Beep. Note: If enabled by your installer, the One-Touch Buttons or a keyswitch can also be used to disarm the area. How do I disarm the system if the alarm was accidentally triggered? The [PRG] Symbol will illuminate and the [BYP] Symbol will flash. 3) Enter the two-digit number(s) of the zone(s) you want to Bypass and the corresponding number(s) will illuminate. If a zone’s number is illuminated and you re-enter its number, the zone will unbypass and the number will extinguish. If a zone’s number does not illuminate and the keypad emits a Rejection Beep, the zone may not have the Bypass feature accessible. The [BYP] Symbol will remain illuminated. Note: If you have a Partitioned System, only the zones in the area(s) assigned to your User Access Code will be affected. The keypad will emit a Confirmation Beep. The [PRG] Symbol will illuminate and the [BYP] Symbol will flash. 3) Press the [MEM button. All zones bypassed during the last time the system was armed will illuminate and will be bypassed. 4) If you wish, re-enter the zone’s number to change a bypassed zone to an unbypassed zone and vice versa. 5) Press the [ENTER] button to exit. You can program the keypads to emit a rapid, intermittent beep whenever designated zones are opened or only when opened between certain hours. These zones are referred to as Chime Zones. Each keypad must be Chime programmed separately. Your installer can program your Chimed zones to also beep upon closure. How do I program a keypad to beep every time a zone opens? 2) Press the button  to enter the Chiming Menu. 3) Press the button. The keypad will emit a Confirmation Beep. The [PRG] Symbol and any already Chimed zones will illuminate. 4) Enter the two-digit zone number(s) you want to designate as Chimed. The keypad will emit a Confirmation Beep and the Numerical Symbol(s) corresponding to the zone(s) will illuminate. If you re-enter the number of an illuminated Numerical Symbol, the corresponding zone will unchime and the Numerical Symbol will extinguish. 5) Press the button to exit. How do I program all the keypad’s Chimed zones to beep only when they open between specific hours? 2) Press the  button to enter the Chiming Menu. The keypad will emit a Confirmation Beep. The [PRG] Symbol and a Numerical Symbol will illuminate. The Numerical Symbol represents the first number of the previously set time ( Symbol = zero). When the [A2] and [A3] Symbols flash, no time is set. 4) Enter the time you want all Chimed zones to start beeping when they open according to the 24-hour clock (i.e. 9 a.m. is 09:00 and 9 p.m. is 21:00). The keypad will emit a Half Beep. 5) Enter the time you want all Chimed zones to stop beeping when they open according to the 24-hour clock. If you want the Chimed zones to beep every time they open, enter the same time set in Step 4. The keypad will emit a Confirmation Beep. When you press the  and  buttons at the same time and hold them for two seconds, the system will generate an alarm. The alarm can be programmed to be either silent or audible according to your preference. Confirmation Beep: When an operation (i.e. arming/disarming) is successfully entered or when the system switches to a new status/menu, the keypad emits an intermittent beep tone (“BEEP-BEEP-BEEP-BEEP-BEEP”). Half Beep: When a step of an operation is successfully entered on the keypad, the keypad emits a short intermittent beep tone (“BEEP-BEEP-BEEP”). Rejection Beep: When reverting to a previous status, or when an operation is incorrectly entered, the keypad emits a continuous beep (“BEEEEEEEEP”). On all Digiplex LED Keypads, the state of the “STATUS”, “AC” Lights, and Action Symbols represents a specific condition in your system. There are three versions of the LED Keypads: the 10-zone, the 20-zone, and the 48-zone keypads. 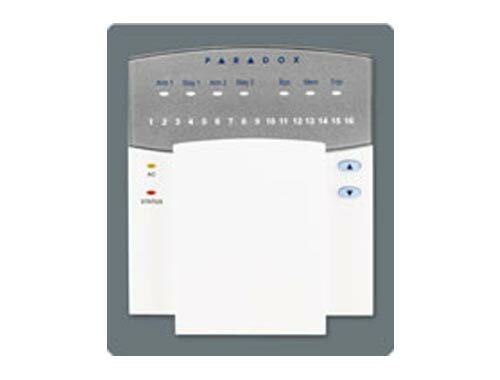 Each keypad can be assigned to one area or many areas in a Partitioned System. The three keypads function in the same way and any reference to one keypad applies to each of the LED Keypads. The only difference between the versions is the number of zones that each can display. The installer can program the keypads not to display the status of your system automatically by changing the LED keypad from Normal Mode to Confidential Mode. In Confidential Mode all the Symbols and Keypad Indicator Lights are extinguished. Depending on how your keypad was programmed by the installer, you must either press a button or enter your User Access Code to activate Normal Mode. If your installer has enabled this feature, the LED Keypad will permit you to complete more than one action without having to re-enter your User Access Code. Press the [CLEAR] button to exit the User Menu. The illumination behind the buttons can be modified to suit your needs. How do I modify the Backlight? The keypad will emit a Confirmation Beep, the [PRG] Symbol will illuminate, and the Numerical Symbol for the current setting will illuminate. 3) Use the [UP] and [DOWN] buttons to increase or decrease the illumination. The range is between zero (Numerical Symbol ) and seven (Numerical Symbol ) with seven being the brightest. 4) Press the [ENTER] button to save and exit. In Area Status Display you will be able to see the status of the individual areas in a Partitioned System. The Area Symbol (A1, A2, A3, and A4) if the area is armed. For example, if you press , and Area 3 is armed, [A3] will illuminate. The Numerical Symbols representing any open zones. For example, if zone 6 was open, then the Numerical Symbol  would illuminate. The [MEM] Symbol if any alarms have occurred. The [TRBL] Symbol if any troubles are occurring. The [STAY] Symbol if the area is Stay or Instant Armed. The [FORCE] Symbol if the area is Force Armed. The [BYP] Symbol if zones are bypassed. The state of the “Status” Light. Access Codes are codes that will allow you and others to access the system. These codes can be programmed to permit access to all or some features and areas. The installer will program User Access Codes to be four digits, six digits, or variable from one to six digits in length. Each digit can be any value between zero and nine. If the installer programmed your system to accept a variable code length, you may have to press the [ENTER] button after entering their User Access Code. Only the System Master Code cannot be less than 4 digits. To delete existing Access Codes, press the [CLEAR] button in steps 5, 6, and 7 in “How do I program Access Codes”. Once the information is erased, press the button to save and exit. The System Master Code will give you access to all the features as well as the ability to add, modify, or delete any User Access Codes. We suggest that you change this code to prevent others from accessing and changing your options without authorization. The keypad will emit a Confirmation Beep. The Area Symbols and the [PRG] Symbol will flash. The keypad will emit a Confirmation Beep. The Area Symbol(s) and the [ACCESS] Symbol will illuminate. The [PRG] Symbol will flash. The keypad will emit a Confirmation Beep. The [PRG] Symbol and the Numerical Symbol of the first number in the code will illuminate ( = zero). The Area Symbols and [ACCESS] Symbol will extinguish. The Numerical Symbols for the next numbers in the code will illuminate one at a time as you enter the new code. When you have entered the maximum number of digits, the keypad will emit a Confirmation Beep. 6) Press the [ENTER] button to exit. Your system can support up to 63 User Access Codes. All codes are given a User Number between 02 and 64 (Code 01 is the System Master Code). User Access Codes can be programmed with various options that will allow you to control the access to your system. Only the System Master Code and codes with the Master feature can program User Access Codes with their User Options and Area Assignment. How do I program a User Access Code? System Master Code or User Access Code with the Master feature only. 2) Press  to enter the User Programming Menu. The Area Symbols of the areas assigned to your User Access Code and the [PRG] Symbol will flash. The Area Symbols of the areas assigned to your User Access Code and the [ACCESS] Symbol will illuminate. The [PRG]Symbol will continue to flash. 4) Enter the 2-digit User Number (02 to 64) you want to program. The [ACCESS] Symbol will flash for an unused code. If the code is used, [PRG] Symbol and first number of the code will illuminate. The [ACCESS] Symbol and the Area Symbols will extinguish. 5) Enter a User Code. If you do not want to change an existing one, press [UP] until you reach User Options. The keypad will emit a Half Beep when it switches to User Options. Preexisting options will illuminate. 6) Program the User Options by turning ON or OFF the options. Once the options are programmed, press [UP] to reach the Area Assignment. The keypad will emit a Half Beep when it switches to Area Assignment. Pre-existing assignments will illuminate. 7) Program the Area Assignment. Press [DOWN] to return to User Options or press [ENTER] to save and exit. The keypad will emit a Confirmation Beep to confirm the code’s acceptance. If the keypad emits a Rejection Beep, you may have chosen an existing User Code or the Master Code used to modify or create the code does not have access to the User Options or Area Assignment programmed. To view the code programmed, instead of entering the User Code in Step 5, the first number of the code programmed will illuminate. Press the [UP] button and the numbers will illuminate one at a time as you press the button (the Numerical Symbol  represents zero). In Table 1 and Table 2 the User Code Option or Area is considered ON when the corresponding Numerical Symbol is illuminated. You turn the Numerical Symbols ON and OFF by pressing the Numerical Buttons on the keypad. on Keypad obeys the User Access Code’s area assignment in a Partitioned System. 3) If problem remains, the alarm will sound again. Press [CLEAR] again. When the [TRBL] Symbol flashes and the  Symbol is illuminated. 1) Press the ] button. The [TRBL] Symbol will flash, the [PRG] Symbol and a Numerical Symbol are illuminated. 2) Enter the hour and minutes according to a 24-hour clock (i.e. 9 a.m. is 09:00 and 9 p.m. is 21:00). The default time will be illuminated one number at a time as you enter the correct time. The keypad will emit a Half Beep when it accepts the new time and switches to programming the date. 3) Enter the correct date according to yyyy/mm/dd. The default date will be illuminated one number at a time as you enter the correct date. The keypad will emit a Confirmation Beep when it accepts the new date. 4) Press the [CLEAR] button to exit the menu. If there are other Troubles with the system, the [TRBL] Symbol will remain illuminated until they are resolved. Contact your Security Company to effect repairs. Two people are needed to complete this test. One person will watch the keypad while the other person walks around and opens the zones (i.e. open the doors and windows that are protected, walk in the path of the motion detectors, etc.). The Numerical Symbols for the opened zones will illuminate when opened. If a zone does not register, contact your installer. Use Area Status Display to view the open zones in other areas assigned to the keypad. Your installer will provide details on the best way to test your particular system. Do NOT use an open flame or burning materials to test your fire detection devices. Your installer will provide details on the best way to test your particular system. Under normal use your system requires virtually no maintenance other than regular testing. It is recommended that your installer change the battery every three years. The system will test all its connections and can send a report to your Security Company. If the system detects a problem, the [TRBL] Symbol will illuminate. Call your installer for repairs. When your system experiences problems or is tampered with, the [TRBL] Symbol will illuminate. Most of the trouble conditions will be programmed by your installer to be reported directly to your Security Company (if connected). The keypad will only display troubles that occur in the area(s) to which the keypad has been assigned. Potential troubles have been sorted into eight groups. The Group headings are listed below with a brief explanation of the potential troubles sorted within each group. We strongly suggest that you simply inform your Security Company of the trouble and allow them to service your system. 1. The [TRBL] Symbol illuminates. 2. Press the [TRBL] button. The [TRBL] Symbol will flash and the Numerical Symbol(s) representing Group heading number(s) will illuminate. 3. Press the Numerical Symbol corresponding to the Group heading to view the specific trouble. If your keypad is in Confidential Mode, the [TRBL] Symbol will not illuminate until you enter your User Access Code or press a button depending on how the keypad was programmed. The control panel has detected a power failure. This means that your system is running on the back-up battery. The AC Light on your keypad will be turned off during a power failure. If this Trouble occurs when your establishment is not experiencing a power failure, call your Security Company for repairs. This means the back-up battery is disconnected, needs to be recharged, or replaced. The bell or siren connected to the control panel has exceeded current limits. The Bell/Siren Output will shutdown until the trouble is rectified. Trouble : ROM check Error The control panel registers a memory error. Trouble : Fail to Communicate PC The control panel is unable to communicate with the Security Company’s diagnostic software. problems (paper jam, no paper, no power, etc.) before calling installer. A device is no longer communicating with the control panel. No communication between the devices and the control panel. The Bus is having difficulty communicating between the devices and the control panel. The Numerical Symbols for the zone or zones that have been tampered with will be illuminated. If a wireless device’s battery needs to be replaced, the Numerical Symbol for the zone that it is assigned to will be illuminated. Also, the yellow light on the device will flash to indicate this trouble. A smoke detector is experiencing a wiring problem, needs to be cleaned, or a wireless device is no longer communicating with its receiver. The time and date have been reset to the default. This is the only Trouble that we recommend that you correct.